Kamadhenu pictured with her calf - !! Welcome to Sudarshana Sena !! The Devi Bhagavata Purana narrates that Krishna and his lover Radha were enjoying dalliance, when they thirsted for milk. So, Krishna created a cow called Surabhi and a calf called Manoratha from the left side of his body, and milked the cow. When drinking the milk, the milk pot fell on the ground and broke, spilling the milk, which became the Kshirasagara, the cosmic milk ocean. Numerous cows then emerged from the pores of Surabhi's skin and were presented to the cowherd-companions (Gopas) of Krishna by him. Then Krishna worshipped Surabhi and decreed that she—a cow, the giver of milk and prosperity—be worshipped at Diwali on Bali Pratipada day. Various other scriptural references describe Surabhi as the mother of the Rudras including Nirrti (Kashyapa being the father), the cow Nandini and even the serpent-people nāgas. The Mahabharata also makes a passing reference to Surabhi as the mother of Nandini (literally "daughter") in the context of the birth of Bhishma, an incarnation of a Vasu deity. 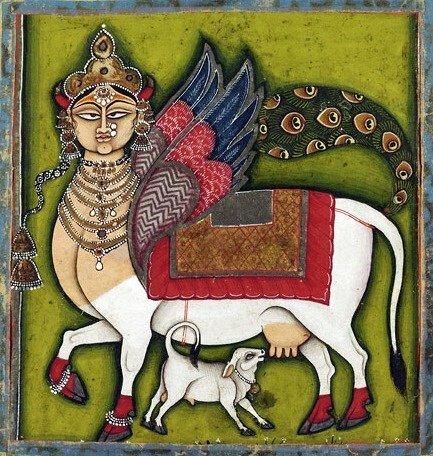 Nandini, like her mother, is a "cow of plenty" or Kamadhenu, and resides with sage Vashista. Nandini is stolen by the divine Vasus and thus cursed by the sage to be born on the earth. The Raghuvamsa of Kalidasa mentions that king Dilip—an ancestor of god Rama—once passed by Kamadhenu-Surabhi, but failed to pay respects to her, thus incurring the wrath of the divine cow, who cursed the king to go childless. So, since Kamadhenu had gone to Patala, the guru of Dilip, Vasistha advised the king to serve Nandini, Kamadhenu's daughter who was in the hermitage. The king and his wife propitiated Nandini, who neutralized her mother's curse and blessed the king to have a son, who was named Raghu. In the Ramayana, Surabhi is described to be distressed by the treatment of her sons—the oxen—in fields. Her tears are considered a bad omen for the gods by Indra, the god-king of heaven. The Vana Parva book of the Mahbharata also narrates a similar instance: Surabhi cries about the plight of her son—a bullock, who is overworked and beaten by his peasant-master. Indra, moved by Surabhi's tears, rains to stop the ploughing of the tormented bullock.